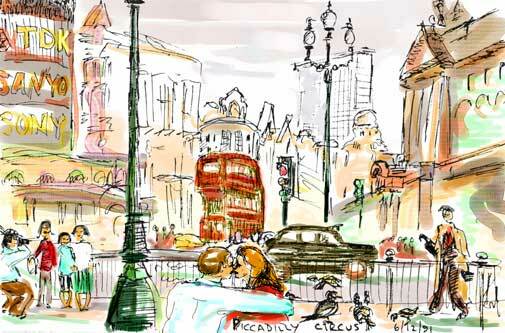 LONDON . . Picadilly. . I stash the bike at a cheap hotel near Earls Court and take the tube to Piccadilly Circus. Londoners in some districts look a bit grungy, sad and separate, a bit like people in Berkeley, or like me. I think of San Francisco with Phyllis  Golden Gate Park, dinner before the opera, art shows, crowds.